“New ideas come into this world somewhat like falling meteors, with a flash and an explosion and perhaps somebody’s castle like roof perforated.” This quotation by Henry David Thoreau aptly captures the burst of insight that occurs when an infant discovers the link between their internal and external worlds; when a preschool child suddenly masters the notion of symbols; when the school-aged child and adolescent approach problem solving with logic and flexibility; and when the adult supplants reasoning with wisdom. In essence, the quote captures the gist of cognitive development. For definitional purposes, cognitive development is the process of reasoning, thinking, and problem solving, which changes over the course of the life span. The first section of this entry begins with a discussion of infant cognition, the second section continues with a focus on preschool cognitive development, the third section covers cognitive development in middle childhood and adolescence, the fourth section discusses adult thinking, and the entry concludes with the fifth section on contemporary issues in cognitive development and directions for the cognitive development in the 21st century. The theoretical perspective responsible for shaping much of 20th-century discourse, thinking, and scholarship on cognitive development is that of the late Swiss scholar Jean Piaget. As a genetic epistemologist, he was keenly interested in understanding the origins of knowledge. He posited such questions as how does knowledge evolve? And where does knowledge come from? He viewed the acquisition of cognitive development as an active process, where the infant, child, and adolescent organize their experiences with their environment, adapt to their environment, and try to maintain a sense of balance with old and new knowledge. He believed that cognitive development occurred in discrete albeit connected stages encompassing the first 15 years of life. These stages were universal, invariant, and qualitatively different. Piaget’s theory serves as the framework for much of the discussion on cognitive development in this entry. Table 1 provides an overview of his stages of cognitive development. How do infants come to know their worlds? What rudimentary capabilities are present in infancy? Without the contribution of Jean Piaget, our knowledge of infant cognition would be limited to the behaviorist perspective, which asserts that learning or cognitive development occurs in a stimulus-response mode. How then does cognitive development progress in infancy? According to the Piagetian perspective, infants “come to know” their world primarily through their senses and motor abilities. These rudimentary motor and sensory abilities lay the foundation for the more complex cognitive skills that will emerge during the latter half of the sensorimotor period and lay the foundation for the cognitive skills that will emerge during the subsequent stages of cognitive development. This progression of infant cognitive development occurs through six substages of the child’s first stage of cognitive development, referred to as the Sensorimotor Period. Table 2 provides an outline of the substages. 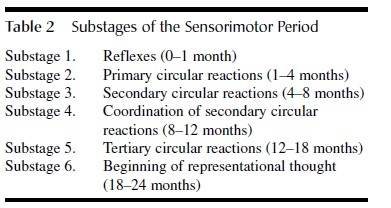 In substage 1 of the sensorimotor period, infants learn about their world through the use of their reflexes. Hence, the infant engages in the world, through sucking, reaching, and grasping. Eventually the use of these reflexes becomes more deliberate and purposeful as the infant progresses to substage 2 of the sensorimotor period. During these 3 months, the infant begins to actively involve his or her own body in some form of repeated activity. Thus the behavior is circular and primary because it centers on the infant’s own body. It is not until substage 3, secondary circular reactions, that the infant begins to engage with objects in the environment. Initially, the contact with external objects (e.g., a crib mobile) is accidental, then with some planning and purpose subsequent contacts are deliberate. These contacts with the external objects become a repeated activity. In due course, the infant will be able to combine these basic reflexes and use planning and coordination to achieve a particular goal, which is substage 4. For example, an infant sees a red ball under a chair in the living room. The infant crawls, reaches, and grasps the ball, thus coordinating both internal and external activities to achieve a planned goal. In substage 5, the infant, now considered the “little scientist” begins an active exploration of its world, with a trial-and-error approach. Combining more mature motor behavior with increased planning and reasoning capabilities, the external world becomes the infant’s laboratory. The sensorimotor period culminates with substage 6 and the emergence of symbolic or representational thought. The toddler now has a basic understanding that objects can be used as symbols for other objects (e.g., a pillow can be used to represent a doll in play). A critical attainment during the sensorimotor period is object permanence. Object permanence is the understanding that objects in our environment have a continued existence even though they may no longer be perceptually available. Piaget felt that infants did not fully master this ability until the substage 5 of the sensorimotor period. There are other cognitive capabilities that begin to emerge during the first 2 years of life. Language is perhaps one of the greatest cognitive achievements. 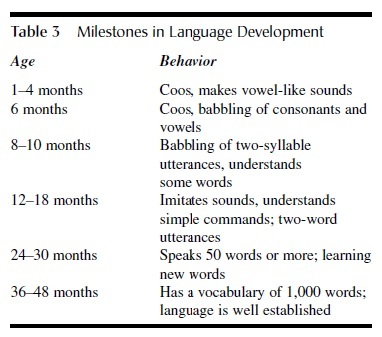 Table 3 provides a brief summary of language acquisition during the first 4 years of life. The preschool child has now entered Piaget’s second stage of cognitive development, the preoperational period. This period heralds a new perception and understanding of the world, brought on by the attainments of the sensorimotor period. One major attainment, the ability to engage in symbolic thought, allows the preschooler to participate in a variety of activities. These activities include understanding pictorial representations, engaging in pretend play, and mastering basic numeracy principles. Understanding pictorial representations (i.e., knowledge that pictures are symbols of real objects) not only reflects the preschooler’s evolving cognitive skills, but also permits the preschooler to engage in varying levels of sophisticated social interaction. As an example, a child is looking through the family photo album with a parent and turns to a page with a picture of a grandparent; the child labels the person in the picture as grandpa. Thus, the preschool child has established that he is aware that the photograph represents a real person. Given their increasing vocabulary, and their developing pictorial representational ability, preschool children are now able to engage in a variety of learning interactions and activities with their parents. When children engage in the various forms of pretend play, they are demonstrating their understanding of the multiple, flexible, and complex uses of symbols. For example, a child uses a block to represent a telephone, the child then speaks into the block and carries on a conversation (with another person); the child then hands the block to a playmate and persuades the playmate to engage in conversation with the block. Furthermore, there are elements of creativity present, as well as some rudimentary understanding of the social aspects of pretend play. Even with the impressive achievement of symbolic thought, Piaget believed that preoperational children experienced some challenges in their thinking and reasoning capabilities, especially regarding issues of quantity. To assess this, Piaget administered his classic conservation of numbers task to the preschool children. The task involved presenting the children with two rows of pennies; one row was then spread out, and the children were asked if the rows contained the same number of pennies. The preschool children frequently stated that the longer row contained more pennies. Thus, Piaget concluded that the preschool children were unable to conserve quantity, and that their performance was due to their inability to focus on relevant aspects of the task (concentration), their inability to mentally reverse the operation (irreversibility), and their inability to understand the difference between transformations and static states. Piaget stated that in order for the preschool children to conserve numbers, they must understand that the two rows are still numerically equivalent despite the differences in the appearance of the rows. Research by Rochelle Gelman has indicated that preschool children comprehend a great deal about numbers. She observed that preschool children possess two basic concepts about numeracy: number abstraction principles and numerical reasoning abilities. Number abstraction principles include an awareness of rules for counting, knowledge of number labels, and strategies for counting. Numerical reasoning abilities involve rudimentary knowledge of the rules for adding and subtracting quantity. Memory and language skills and abilities show vast improvement during the preschool period. For example, preschool children have well-developed memories for everyday events that happen in their lives and can articulate those experiences (e.g., what happens when you go to McDonald’s?). Language becomes less egocentric, and they are able to engage in various forms of social discourse. Vocabulary development continues, and individual differences in vocabulary and overall language competence emerge during this time period. The child in middle childhood has now entered Piaget’s third stage of cognitive development, the concrete operations period. Unlike the preschool child, the concrete operations child has now acquired what Piaget referred to as mental operations. Mental operations are the ability to use logic when solving problems. This is evident in such Piagetian tasks as the conservation tasks. Thus, the major hallmark of this period is the ability to conserve not only quantity but other domains as well (e.g., liquid, mass). The classic conservation tasks described in the previous section discussed the challenges that preschool children encounter with such an activity. Children in middle childhood possess the ability to decenter, to comprehend transformations, and to engage in reversibility of thought. In addition to these attainments, children in middle childhood are also able to engage in a variety of classification and categorization activities. That is, they can appreciate that objects and items belong to several categories. For example, preschool children and children in middle childhood are presented with the following classification problem. They are presented with a group of animals consisting of two collies, three great danes, five poodles, and six German shepherds. The children are asked the question, “Are there more German shepherds than dogs?” Preschool children would state there are more German shepherds. On the other hand, children in the concrete operations period would state that there are more dogs than German shepherds, because they are able to understand that shepherds belong to both a general category (dogs) and a subcategory (specific type of dog). This attainment as well as the others discussed below might well account for the interest that many school-aged children have in collecting objects (e.g., bugs) and classifying their classmates (e.g., ranking by looks, niceness). Concrete operations children are also able to engage in the seriation of objects, which involves sequencing or ordering items according to such dimensions as height, color, size, or shape. Language and memory abilities also improve during this time period. Vocabulary continues to build, and memory becomes a vehicle for learning. Their metacognitive skills, or their understanding of their memory and learning competencies, improve. Consequently, they are able to use their metacognitive knowledge to improve their learning of academic material. The adolescent has entered Piaget’s final stage of cognitive development, the formal operations period. The hallmark of this period is the ability to think abstractly. In contrast to the concrete operations child, the formal operations adolescent is able to use logic to solve problems, and these problems can be abstract rather than concrete in nature. Also in contrast to the child in the concrete operations period, the formal operations adolescent can reason about such issues as spirituality, politics, and abortion. In addition to the ability to think abstractly, the formal operations adolescent can engage in what Piaget referred to as hypothetico-deductive reasoning. Hypothetico-deductive reasoning is the ability to generate hypotheses and systematically test each hypothesis. As an example, a formal operations adolescent wishes to obtain the family car, (e.g., I want to use the car tonight); he generates several hypotheses (e.g., I could ask mom, or I could ask dad); then he can mentally test the hypothesis (e.g., Now if I ask mom she might say no, so dad may be the more reasonable one to ask). Formal operations adolescents can also envision and speculate about the future, and they can reflect on their own thinking. Thus, programs that encourage discussion of future plans and goals and decision making are often effective in facilitating the cognitive development of adolescents. Language and memory skills show a dramatic improvement over the language and memory skills observed during the middle childhood period. The formal operations period concludes Piaget’s focus on cognitive development. While he acknowledged that cognitive growth and development continue throughout the life span, he felt that adult experiences were too diverse to capture characteristics that would encompass the universality of the experiences of all adults. Nevertheless, his conceptualization of cognitive development has influenced many theoretical perspectives on cognitive development in adulthood. There is consensus from investigators who study cognitive development in adulthood that adults conceptualize problems differently from adolescents and shift from relying solely on logic to combining logic and “common sense” when reasoning about issues. Furthermore, there is acknowledgement by these researchers that the issues that adults are confronted with differ significantly from the more scientific and academic issues that adolescents have to deal with. However, there is a great deal of variation in how researchers define adult cognitive development and a great deal of variation in the way in which they frame research questions about adult cognitive development. As a result, the focus on cognitive development in adulthood is multifaceted. There are researchers who have put forth the idea that the Piagetian stages of cognitive development should be expanded to encompass adulthood. They have introduced the term post–formal reasoning. These scholars maintain that both the issues and patterns of reasoning in adulthood are qualitatively different from those of adolescence. Post–formal reasoning could be classified into the following categories. 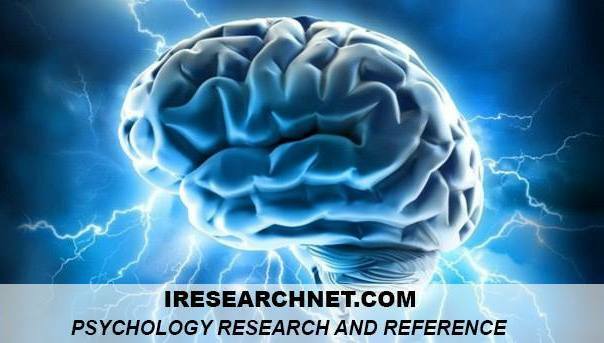 In contrast, there are researchers who have operationalized cognitive development as intelligence and investigated which aspects of intelligence remain the same from young adulthood to late adulthood and which aspects change over the life span. The Cattell-Horn theory of crystallized and fluid abilities is a frequently cited example in the literature on aging and intellectual changes. According to these researchers, intellectual abilities can be classified into two general categories: crystallized and fluid abilities. Crystallized abilities are those abilities that are assessed by vocabulary and creativity subtests of IQ measures, and fluid abilities are those abilities that are assessed by timed reasoning, problem-solving, and math subtests of IQ measures. According to the theory, crystallized abilities increase or remain the same from young adulthood to late adulthood, whereas fluid abilities have been shown to decrease from young adulthood to late adulthood. Recently there has been some debate about whether fluid abilities do in fact decrease. A study conducted in the 1980s found that older adults could be trained to improve their performance on measures of fluid ability. Other research has demonstrated that noncognitive factors may contribute to the observed decline in fluid abilities rather than age per se. Finally, there are researchers who have examined memory and explored how memory changes from young adulthood to late adulthood. Three aspects of memory have been explored by researchers in the psychological literature. These include episodic memory, which is a person’s memory for personal events (e.g., what was your 5th birthday party like? ); semantic memory, a person’s memory for world information (e.g., what is the capital of France, meanings of words); and cognitive resources (e.g., short-term memory) and noncognitive factors (e.g., health). Based on findings from the literature, age comparisons suggest that younger people for the most part have better episodic memories than do older adults. On the other hand, there are few age differences in semantic memory, with the exception that younger adults are faster in retrieving semantic information than are older people. There is some evidence to suggest that working memory declines in late adulthood. That is, older adults experience some challenges in retrieving information from working memory. Lastly, such noncognitive factors as health (older people in poor health experience problems with memory) influence the memory performance of older adults. During the latter half of the 20th century, cognitive developmental psychologists turned their attention to investigating the following issues and questions. What is the relationship between brain development and cognitive development? On the one hand, the specific focus has been to identify how brain changes (e.g., structure, function) influence language and other cognitive capabilities. On the other hand, researchers are beginning to explore and specify the brain changes that contribute to intellectual decline in old age. During the 21st century this area has been a hot topic for researchers in cognitive development. In addition to the focus on brain changes and cognitive development, researchers are continuing to explore the role of social influences on cognitive development. The works of the late Russian theorist Lev Semonvich Vygotsky have contributed to this interest. Researchers are particularly concerned with investigating how social and cultural influences shape cognitive development early in life and how social and cultural influences have a continued effect on cognitive development throughout the life span. Theory of the mind reemerged in the latter half of the 20th century and the beginning of the 21st century as a topic of interest for cognitive developmentalists. Such questions as how do children understand the intentions of others and how do children develop an understanding of the critical aspects of human thinking and behavior have occupied a central focus in the area of social cognition in the past decade. Finally, the area of eyewitness testimony continues to have a prominent place in the field of cognitive development in the 21st century. Researchers are exploring ways to reduce the influence of interviewer suggestibility on eyewitness testimony and to increase the accuracy of eyewitness testimony of both adults and young children. Flavell, , Miller, P. H., & Miller, S. A. (1993). Cognitive development. Englewood Cliffs, NJ: Prentice-Hall. Johnson, H., Munakata, Y., & Gilmore, R. O. (Eds.). (2002). Brain development and cognition: A reader (2nd ed.). Oxford, UK: Blackwell. Moshman, D. (1998). Cognitive development beyond childhood. In Kuhn & R. S. Siegler (Eds. ), Handbook of child psychology: Vol. 2. Cognition, perception, and language (5th ed.). New York: Wiley. Piaget, (1952). The child’s concept of number. New York: W. W. Norton. Siegler, , & Alibali, M. (2005). Children’s thinking. Englewood Cliffs, NJ: Prentice-Hall. Vygotsky, S. (1978). Mind in society: The development of higher psychological processes. Cambridge, MA: Harvard University Press. Wellman, H. , Cross, D., & Watson, J. (2001). Meta-analysis of theory-of-mind development: The truth about false belief. Child Development, 72, 655–684.